The Independent Guide to eBay 2012, by Simon Brew, details the results of 130 eBay tools, websites and services that have been tested and reviewed, along with expert advice on what you need to get started on eBay. He reveals the secrets of being a successful buyer and seller on eBay from help on setting up your PayPal account and putting together a good listing, to explaining how to set up your own eBay shop and successfully managing your email. 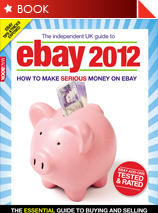 This 2012 guide is packed full of great information for beginner and advanced eBay sellers. In fact, Mr. Brew highlights ReplyManager as an online email management tool that is worthy of trying and important for serious eBay sellers. We do want to point out that the pricing he quoted was based on old pricing and that we no longer charge a set-up fee.